Chariots, a spinning tea cup, and 14 prancing steeds await the imagination of children, as well as adults. The carousel is lowered to ground level so that it is accessible for wheelchairs, allowing children to transfer to the tea cup. The chariot is designed to allow for transfer to a seated position or to remain seated in the wheelchair. Please purchase your ride tokens at the Office. 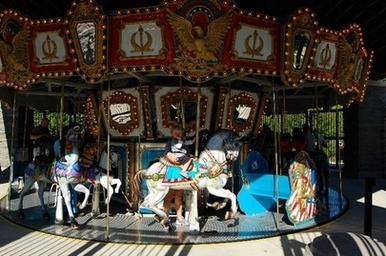 *The carousel does not operate in conditions such as heavy rain, thunder, lightning, and temperatures less than 55 F .